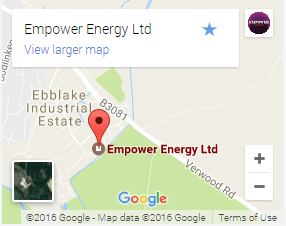 Air Source Heat Pumps are one of the most popular forms of energy efficiency heating solutions to consider. 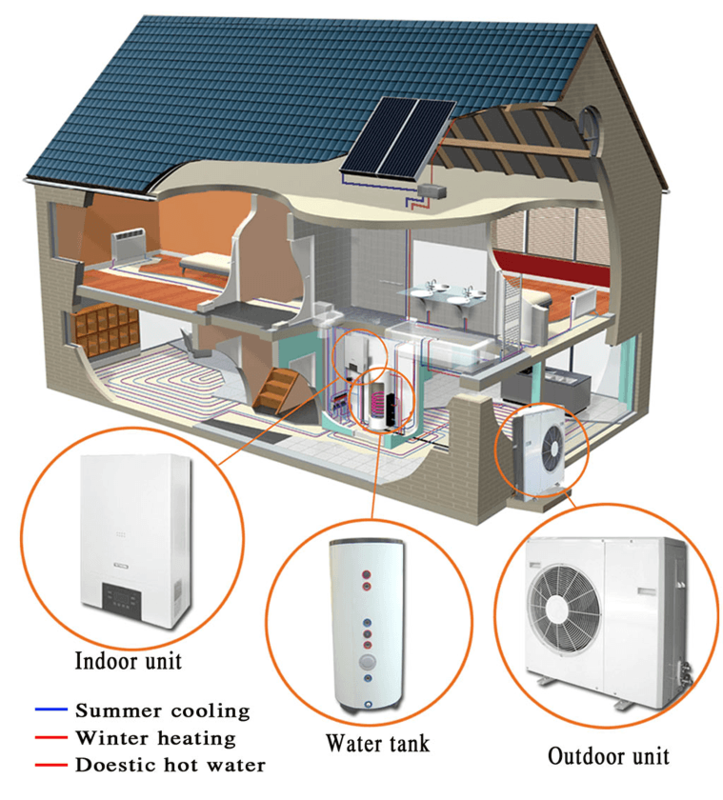 ASHPs offer a major step forward in energy efficiency and climate control in any area whether large or small, they utilise free heat from the environment extracting heat from outside temperatures as low as -20 degrees whereas traditional heating system use fossil fuels. 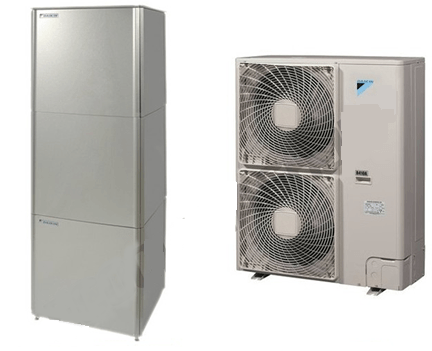 Empower Energy offer a wide range of Daikin heat pumps from the standard domestic to the larger commercial units, our partner installers work closely with us to ensure our installations are operational with minimum disruption to our Customers. ASHPs consume much less electricity to produce heat so for example a traditional gas boiler at 96% efficiency, for every unit of cost, you will only produce less than one unit of energy whereas an ASHP will produce 1 in 3 so one unit of cost will produce three units of heat COP (Co efficient of performance). RHI (renewable heat incentive) The Government grant schemes has been in operation for many years offering substantial benefits for Domestic and Commercial Customer who are considering installing this type of technology. Eligible for (MCS) Microgeneration Certification Scheme. Eligible for enhanced Capital allowance (ECA). 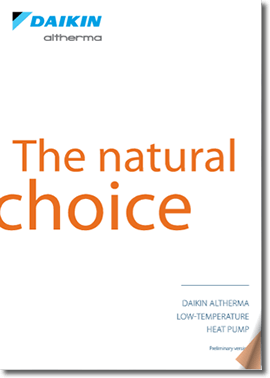 The new Daikin Altherma LT Split is a low temperature heat pump designed for the highest seasonal efficiencies. So, it’s ideal for new build, retrofit and low energy houses – and is accredited by the Microgeneration Certification Scheme (MCS) accreditation for compliance with funding schemes. The structure of the hot water tank ensures optimum water hygiene since the water to be heated is carried in a pipe system. Deposits of sludge, rust, sediments and even the generation of dangerous legionella bacteria which can arise in large volume tanks are not possible. 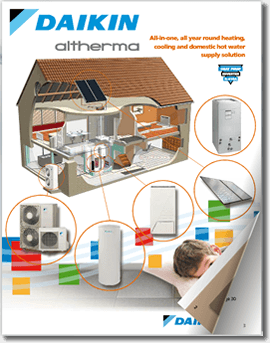 A Daikin hot water storage tank provides you with hot water at any time, in line with the latest water hygiene requirements. Heat loss is reduced to a minimum thanks to the high quality insulation. 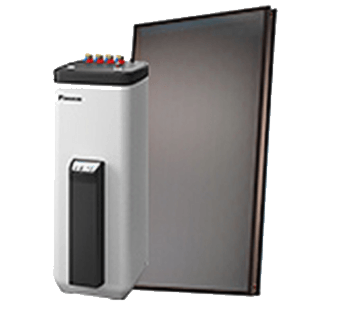 If you combine our water heaters with our thermal solar collectors, you can use the free power of the sun highly effectively. 1. Refrigerant in the heat exchanger absorbs heat from the outside air and evaporates. 3. Hot vapour is condensed in the 2nd heat exchanger where heat is rejected, which feeds into the central heating and hot water system. 4. The liquid refrigerant passes back through an expansion valve, to start the cycle again.